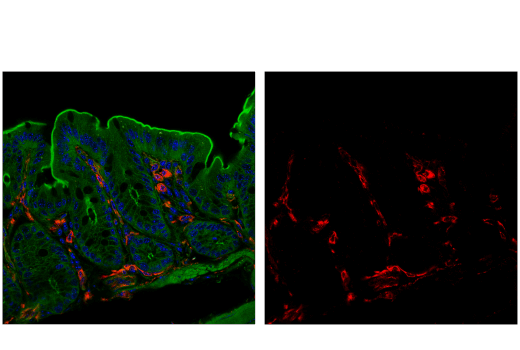 Confocal immunofluorescent analysis of mouse colon using VISTA (D5L5T) XP® Rabbit mAb (Alexa Fluor® 647 Conjugate) (red). Actin filaments were labeled with DyLight™ 488 Phalloidin #12935 (green). Samples were mounted in ProLong® Gold Antifade Reagent with DAPI #8961 (fluorescent DNA dye). VISTA (D5L5T) XP® Rabbit mAb (Alexa Fluor® 647 Conjugate) recognizes endogenous levels of total VISTA protein. Monoclonal antibody is produced by immunizing animals with a synthetic peptide corresponding to residues surrounding Val291 of mouse VISTA protein. This Cell Signaling Technology antibody is conjugated to Alexa Fluor® 647 fluorescent dye and tested in-house for direct immunofluorescent analysis in mouse tissue. This antibody is expected to exhibit the same species cross-reactivity as the unconjugated VISTA (D5L5T) XP® Rabbit mAb #54979. VISTA (V-Domain Ig Suppressor of T Cell Activation) is a negative checkpoint control protein that regulates T cell activation and immune responses. VISTA, which contains a single Ig-like V-type domain, a transmembrane domain, and an intracellular domain, has sequence similarity to both the B7 and CD28 family members. Although primarily expressed by myeloid cells, VISTA is also expressed by CD4+, CD8+, and FoxP3+ T-cells. Thus, VISTA is described as both a ligand and a receptor (1-3). Blocking VISTA induces T-cell activation and proliferation, and potentiates disease severity in the EAE model (1). Furthermore, genetic deletion of VISTA in mice leads to spontaneous T-cell activation and chronic inflammation (4,5). In mouse models of cancer, neutralization of VISTA enhances T-cell proliferation and effector function and increases tumor infiltration, suggesting VISTA blockade could be an effective strategy for tumor immunotherapy (6,7). Wang, L. et al. (2011) J Exp Med 208, 577-92. Flies, D.B. et al. (2011) J Immunol 187, 1537-41. Lines, J.L. et al. (2014) Cancer Res 74, 1924-32. Wang, L. et al. (2014) Proc Natl Acad Sci U S A 111, 14846-51. Liu, J. et al. (2015) Proc Natl Acad Sci U S A 112, 6682-7. Le Mercier, I. et al. (2014) Cancer Res 74, 1933-44. Lines, J.L. et al. (2014) Cancer Immunol Res 2, 510-7.